Plate XVIII. HACKNEY STALLION, POLONIUS 4931. Chestnut Horse by Wildfire 3224; dam 1301 Ophelia by Denmark 177 or Danegelt 174. Winner of numerous prizes and sire of many winners. The Property of R. Whitworth, Esq. There remains, however, one further point upon which the detractors of the Shire horse are united, and that is, the amount of silky hair or "feather" which adorns his legs. This, it is contended by some, is absolutely prejudicial to the welfare of the horse; they assert that it is productive of grease and other kindred ills; that a profusion of feather presupposes a coarse skin; and, above all, that any animal that is the possessor of much hair is totally unadapted for agricultural work, as its legs would soon become clogged with soil if it were put to work on wet and heavy ground. As may be readily supposed, the above objections to the Shire horse, as promulgated by his opponents, are vigorously combated by those who are included in the circle of his admirers; whilst, placing aside the two first charges laid against feather, as being more suited for consideration by the veterinary portion of this work, it may be suggested that as the labours of the very heavy feathered Shires are more usually restricted to town than country work, the possibility of its being clogged does not apply with any particular force. Nor can it be supposed that the breeders of Shire horses are influenced in their desire to produce plenty of hair upon the legs by merely sentimental feelings, for this is not the case. They assert that without feather there is likely to be a deficiency of bone, both as regards quantity and quality, each of which is essential in the composition of an animal possessing such an enormous frame. It is only fair, therefore, to allow the breeders who have studied the matter and thought it well out to decide what is correct and what is not, in connection with the attributes of the breed, as it is certain that the practical men in whose hands the variety now is, would be the last to introduce any fancy points into the composition of an animal in the excellence and utility of which they take so much pride, and whose development is a source of both profit and pleasure to themselves. From the ancestry and uses of the Shire horses we pass on to notice the general appearance and the salient features of the breed. Here we have based our description upon the ideas of the late Mr. Sexton, which are published in the official Stud-book of the Shire Horse Society. It may, however, be premised that while differences may be found in the appearance of the horses that come from different districts, it is noticeable that during the past few years a greater uniformity of character has been brought about through the efforts of the Shire Horse Society, and the loyal support it has received from breeders and exhibitors in all parts of the country. This is to be accounted for by the facilities for interbreeding which the development of railways has provided, and also by the strict adherence to the standard that has been set up by members of the society and outside breeders alike, whilst the general disposition that exists to support the same type, is in itself a resolution that has most favourably influenced the progress of the breed during the past few years. As to the matter of conformation, it need hardly be said that in the general make-up of the Shire horse the head is a very important feature, and particularly in the case of the stallion. Here it should be of decidedly masculine appearance, with nothing of the gelding or "quality horse" about it. It should be long, not too lean, but massive, with a broad forehead, long thin ears pointing rather forwards, and bright and fairly prominent eyes. The forehead should neither be too prominent nor too flat. The nostrils should be capacious, and the jaw deep and strong, with a liberal distribution of strong hairs over the skin. It can scarcely be contended that the head-piece of a Shire horse is exactly pretty, but when well set out and in harmony with the rest of the body it gives finish and character to the whole. 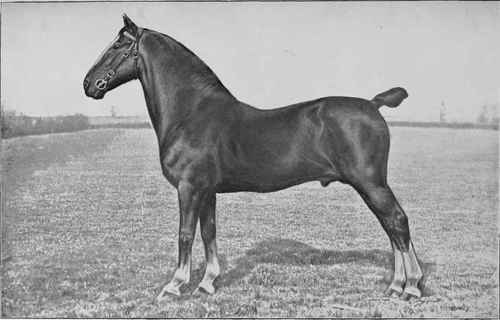 The neck is of fair length only, but not too long, rather substantially developed, nicely arched, and well proportioned; whilst the shoulders, which are a most important point in connection with the development of any variety of draught horse, should slope a little from the withers downward and forward, but not too much so. If they are too straight the movements are clumsy, and the activity of the horse becomes impaired; whilst on the other hand, if they slant like those of a Hack, they do not so well adapt themselves to the purposes of draught, since they fail to fit the collar as is desired. The girth of the Shire horse is, of course, enormous, but not unnecessarily so when it is remembered that a plentiful supply of heart and lung room is desirable in the case of most animals, and in none more so than in those which are called upon to exercise their highest powers of draught and to undergo long and continuous exertion. The ribs consequently should be well sprung, and the loins wide and powerful, the back being short and level, whilst the quarters must be long, of great strength, and as muscular as possible. The tail should be well set up; when low down it gives the quarters a drooping character, and spoils the top-line. The fore-legs, which are a most important item in any draught-horse, should be short, straight, and well set apart. The arms should be wide and muscular, and join on to big bold knees; while the legs below should be flat and clean, and the outline of the sinews clearly marked, the latter point being a very essential one to secure. Strength of pasterns is a most desirable quality, but these parts are most objectionable when unduly long or unduly short. There is another point to be considered in connection with the foredegs, and that is in regard to their position when compared with the body of the horse. They should be nicely set under him, squarely and truly, so as to receive and support the full weight of his frame as evenly as possible, since if out of the plumb-line the strength of the fore-legs will be materially diminished. Scarcely of less importance are the hind-legs, as upon the formation of these limbs depends much of the ability to start away with and keep in motion a heavy load, whilst in backing they are indispensable. They should be rather inclined to be straight, a decided bend being a bad fault in a draught-horse. The hocks require to be broad in front and deep behind, and, of course, perfectly clean and free from any symptoms of weakness or disease. Below the hock the canons should be heavy in bone, showing a girth of at least 1 inch more than the corresponding part below the knee. The joints should be large, and free from structural defect, else the value and utility of the horse will be diminished. Both the fore-and hind-legs should be plentifully supplied with long silky hair, extending a considerable way upwards from the ground in the direction of the knees and hocks, and finer in quality in mares than horses. If this is coarse in quality or curly it is a fault. Full allusion has already been made to the question of the "feather", and it only remains to say that without it in profusion neither sires nor dams are qualified for prizes or patronage. Next comes the all-important question of feet, than which none is deserving of greater consideration on the part of breeders and judges; for however grandly topped a horse may be, he is of no use to anybody if he has not legs and feet to carry him. In this connection it is essential to see that the fore-feet are of the same size, for often they are not, and this, of course, will detract considerably from the value of the animal. They should be wide and open at the heels, and of a good size, and the horn should be dense, tough, and dark in colour. The hind-feet should stand square with those in front, turning neither out nor in, and be hard and durable. The height of a Shire horse should be a good 17 hands when he is full-grown, whilst in the case of mares less height is permissible, but 15.3 hands at shoulder is quite small enough.